How to create a compelling and formal Meeting Agenda for weekly meetings? We provide a perfectly written Weekly Meeting Agenda that fits your needs! The way you present yourself as a company, internally and externally, is important and should always have your attention. This standardized Meeting Agenda template with text and formatting as a starting point to help professionalize the way you are working and communicating internally. As you know, communicating in a professional manner will get you respect and will bring you new opportunities in life and business. Therefore, we support you by providing this Weekly Meeting Agenda template and you will see you will save time and increase your effectiveness. Please note this template is provided for guidance only. Letters and other correspondence should be edited to fit your personal situation. 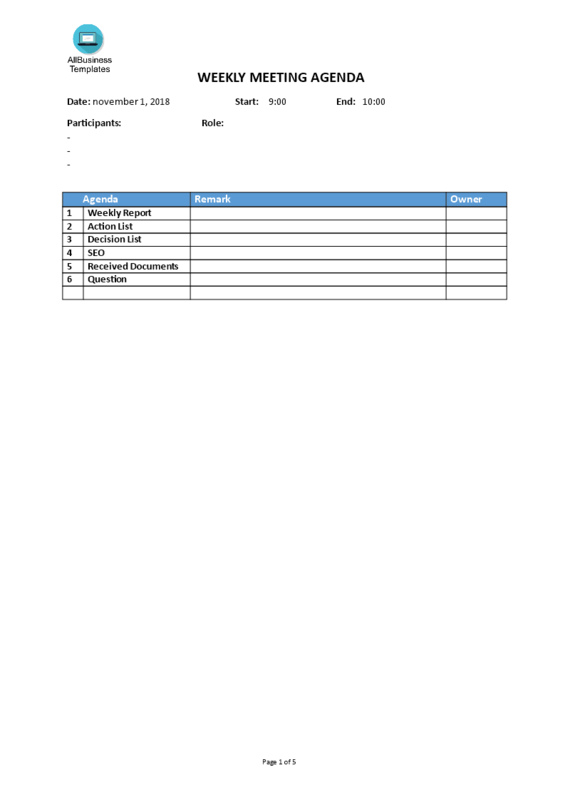 Download this formal Weekly Meeting Agenda template now, good luck!